Set in a glorious natural amphitheatre of almost 30 wooded acres on the edge of the village of Playford, five miles north of Ipswich, magical Playford Hall, listed Grade II*, has known splendour and neglect in almost equal measure. The enchanting late-Tudor house, which towers above the sparkling water of its surrounding moat, was originally the service wing of an Elizabethan mansion built in the 1590s for local grandee Sir Anthony Felton, and partly demolished in the 1750s. Successive occupants have left their mark, among them the present owners, Mr and Mrs Richard Innes, who have nurtured and extended the spectacular gardens laid out by Lady Aitken in the 1960s. Playford Hall has been their home for almost 40 years, and is now for sale through Savills (020-7409 8885) at a guide price of £3.25 million. 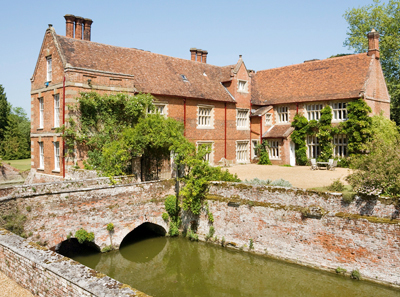 Playford was owned by the Feltons from the late 1400s, and following Sir Anthony’s death in 1613, continued in the family until 1719, when it passed to Elizabeth, daughter of Sir Thomas Felton, the 4th baronet. She married John Hervey, 1st Earl of Bristol, whose seat was at nearby Ickworth, and Playford remained part of the Bristol estate until after the Second World War. In about 1700, the house and grounds were remodelled by Sir Thomas Felton, an important courtier who was Comptroller of the Household to Queen Anne. He built a colonnade linking the east and west wings, repaired the entrance bridge and rebuilt the south end of the west wing, adding new large windows with rendered keystones. He also remodelled the much grander east wing to give the hall a more fashionable look, and, in 1708, had a former public road diverted away from the house to ensure greater privacy. When Sir Thomas died in 1709, things took a turn for the worse at Playford Hall. slavery campaigner. In 1816, Frederick, 5th Earl of Bristol, a university friend from Cambridge, gave him the lease of the hall and its 340-acre farm ‘at a very modest rent’ in recognition of his life’s work. Clarkson had the house repaired and returned the farm to profit. He died at Playford Hall in 1846, aged 86, and is buried in St Mary’s church. In 1871, the Marquis of Bristol had the hall restored and re-gentrified by the architect Richard Makilwaine Phipson. Changes included the conversion of the former kitchen into a fine new dining room, with a handsome fireplace and a large new window created in the space previously taken up by the old kitchen range; the height of the original room was reduced by creating a false ceiling some 3ft below the room above. The lush green terraces seen today on the west side of the moat were then the site of farm buildings, which were removed by Phipson in the run-up to the restoration. Despite being used as a billet for American airmen during the Second World War, Playford Hall has fared well in recent years. Its present owners are particularly proud of the gardens and grounds where, in summer, Mr Innes tells me, ‘roses cascade down the moat walls, the air is scented by philadelphus, hebe and lilac, kingfishers dart across the moat in brilliant flashes of blue and otters play in the water’. The house is also in excellent heart. Accommodation on three floors includes four reception rooms, a family kitchen, master and guest suites, seven further bedrooms and four further bathrooms, plus a coach house, two gate lodges, barns and a flat. The 29 acres of grounds include a lake, a tennis court, paddocks and woodland, bounded to the north by the dreamy River Fynn. ‘Every now and then, Norfolk throws up one of those unexpected gems that you never knew existed,’ says Louis de Soissons of Savills (01603 229229), who quotes a guide price of £1.695m for Grade I-listed Hales Hall at Loddon, 13 miles south of Norwich. lawyer and judge, who became Henry VII’s Attorney General in 1485. His youngest son Myles founded the Hobart line that built Blickling Hall, Norfolk,but his eldest son, Walter, and his family remained staunch Catholics, facing huge fines as recusants under Henry VIII. By 1647, their fortune had run out, and the hall was bought by a local property speculator. It later passed to several absentee landowners, before being acquired in the mid-1800s by the Crisps of nearby Kirby Cane Hall, who let it to a succession of farming tenants. The house and its barn were in a ‘parlous’ state when nursery-man Terence Read and his wife, Judy (named Living National Treasures by Country Life in June 1996), bought the dilapidated property set in nine acres of moated grounds. With their sons Simon and Stephen-one a builder, one a talented joiner-they established Reads Nursery in the grounds of the hall, and gradually set about restoring the house and barn. ‘The house hadn’t been lived in for years, and was considered too cold and damp even for the pigs when we took it on. We sourced materials and fittings from houses that were being demolished around the county, such as the halls at Bawburgh, Flixton and Wood-bastwick,’ Mrs Read reveals. The house, which has scope for further renovation, has four/five reception rooms, a kitchen, six bedrooms, extensive attics and two bathrooms. The former gatehouse and bothy cottage have been refurbished as holiday cottages, which are let on a regular basis. Meanwhile, the extraordinary, 184ft, thatched Great Barn has been restored and re-roofed and established as a popular venue for charity fundraisers and concerts, and is booked solid for weddings every week of this year from May to September. The gardens and grounds are scattered with impressive examples of trimmed yew and box topiary, and ornamental trees such as mulberry and magnolia. There is also a well-stocked mixed orchard and an area of meadowland overlooking open countryside, with all phone and electricity lines leading to the property buried safely underground.